I have a feeling I’m not the only one in the world who has mixed feelings about it. My mom died in 1996, after a stroke that left her alive but unable to care for herself for the better part of that year. I was 26 at the time and it was all on my shoulders. I was hardly in a position to deal with what was happening. To say our relationship was strained would be putting it mildly. Even as she was on her deathbed, I could not hug her. I remember the hospice social worker telling me the time was getting close and she said if I had anything to tell my mother, I needed to do it soon. I got into the bed where she was laying and just looked at her. I tried to hold her hand, to be close with her. It was extremely difficult. They shared stories of how she had inspired them, lifted them, giggled with them, partied with them, and traveled with them. I felt confused. Wait, this was my mother? What about all that other stuff? It’s a terrible thing to long for a closeness with someone you’re afraid to get close to. I felt ashamed to admit to anyone that I was afraid to hug my mother. My truth was, she was often mean to me. She could be sarcastic. And, when the chips were down, she wasn’t there for me. I did not feel warmth or a sense of safety around her. But I couldn’t tell anyone at the time. My experience of her was different from practically everyone else, so I held it in and kept a smile on my face. I was the one who took care of her the weeks before she died. I had some assistance from hospice (bless their hearts) still, I was alone with her day and night. The feeling that our relationship should be different was overwhelming. The pressure of the outside world assuming it was different was quite challenging to deal with. It would be truer to say I felt nothing than to say I felt something. I was her person. It had always been this way. From the time I was a little girl, I understood I was there to take care of her. But the day she died, I lay next to her just looking at the woman she was. It was the first time I allowed my truth to be there. I stopped pretending that all was wonderful, and I let my sadness, disappointment, and anger in. To the best of my ability at the time, I allowed everything to be there and for the first time it felt like I was whole. I wasn’t just pretending all was well between us, I wasn’t just smiling and doting on her. I was acknowledging the flaws too. And a new awareness came with it. My mom was wounded too. Things happened to her too. As she died, I realized that we only ever have this moment. We can’t know what will happen in the next one. I could not afford to waste precious moments wishing that she and I could have things be different. I couldn’t change what happened. It happened. But I could learn to be in the here and now. I could learn to love and forgive myself, and somehow love and forgive my mother. Today my truth is, there’s so much I didn’t know. I spent years hating her and blaming her for not giving me the kind of love I wanted. But you know what? She was a little girl too. She was a human being too. A once hopeless romantic who left Germany behind to marry an American GI she barely knew. He left before I was born. She carried me in her belly while her whole world seemed to be crashing down around her. With her heart breaking, she still managed to get up to feed me and change me and rock me back to sleep. She did her best. And YES it was not great, and YES I was afraid of her. And YES when I share some of the stories with friends, they are appalled. Still, I forgive her for not being who I hoped she would be. 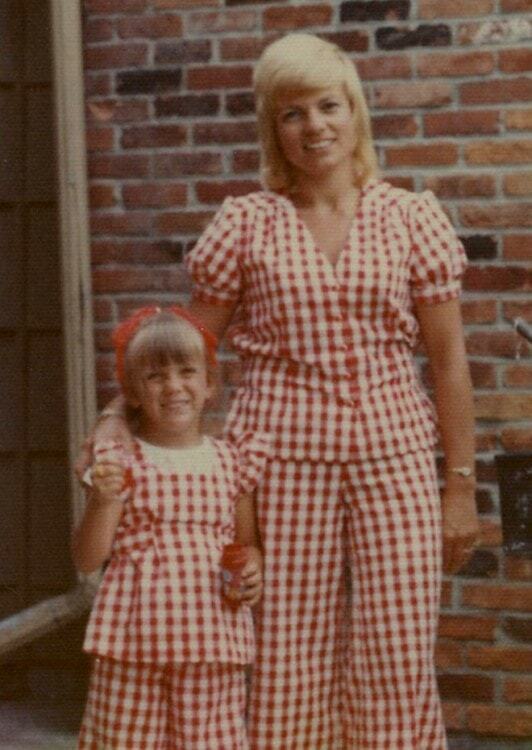 Every day, I find a little more compassion for my Mom and her journey – for the little girl in her who stayed lost and lonely throughout my childhood, who needed me to be not just a daughter but a playmate and sometimes mother to her. It doesn’t excuse what happened to me in the process. Still, I am finding compassion and forgiveness for her anyway, I am sending her light for her continued journey anyway. Wholeness is about acknowledging ALL of what happened, and allowing the feelings to be exactly as they are. My greatest healing has come from this practice. This is the way the light gets in. A lot of my journey has been learning to receive mothering while letting go of the longing for it to come from MY mother. I’ve since learned that mothers are everywhere. You can feel it in the smile of the flight attendant, or the woman who serves your coffee while calling you ‘Hon’. From a friend who texts you to say, “I love you” to the stranger who gives up their seat on the bus for you. You can take it in, and let yourself be mothered just a little at a time. Small doses of mothering are good, like little baby steps toward wholeness. You can even be your own good enough mother. Let her love and comfort you. After all, you’re the most informed on the topic of just exactly how you’d like to be loved and nurtured. I wrote this post in the hopes that my story will awaken something in you. May it inspire you to sit with your own story with love and kindness. Perhaps there is a part of you that can find compassion for your mom, but also for yourself. It’s okay if you’re feeling a mixed bag of vibes about Mother’s day. You belong here. You are loved and welcomed here exactly as you are. I welcome you to share your story here.